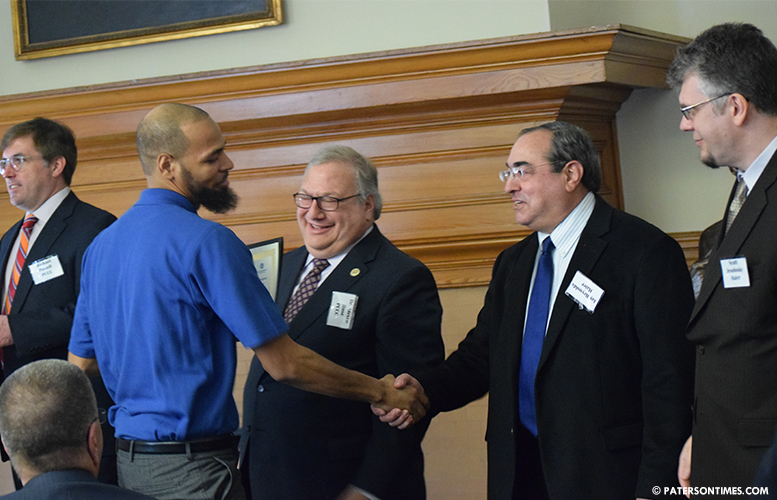 Jason Johnson is one of the ten next generation appliance technicians trained through a partnership between Passaic County Community College and global consumer electronics and appliance giant Haier to replace a rapidly aging workforce. Johnson graduated on Tuesday morning after an intense 14-week program that taught him how to service and repair refrigerator, air conditioning, laundry, dishwasher, cooking, and television products. “It was difficult at first because I never got my hands into this type of environment, but I learned a lot. It was great on the experience,” said Johnson, 34, of East Orange. A pest exterminator, Johnson is hoping to secure a position as a technician with his newly minted certificate issued by the county college through the Hands on Expert Learning Program (HELP) funded through a Department of Labor grant from the New Jersey Community College Consortium. New Jersey community colleges received $15 million to run similar programs. The college bills the New Jersey Community College Consortium for reimbursements. It costs the program $5,000 per student, according to college officials. “The networks of technicians are aging,” said Jay Reynolds, vice president of service at Haier America. He said companies need well-trained technicians in the field that grows at a steady 1-percent per year. Reynolds, citing U.S. Census data, said 35-percent of technicians in the country are 55 or older. As these older employees leave the workforce there’s ample opportunities for well-trained technicians like Johnson. “We train technicians from the bottom up. They went from zero to now graduation,” said Reynolds. Paul Pieri, an electronics engineer, came out of retirement to teach the first cohort in the program. He said student age ranged from mid-20s to late-50s. He described the ten as the most dedicated for going through the “pain” of learning a large set of new skills. “You stuck with it,” Pieri told the graduating students. “You have something that will last a long time.” His class began with 16 students, but by the third week it dropped to 10. Jasmine Jones, 24, of Paterson, said she learned to repair washers and driers. She described the program as fast-paced. “You get all this information and it’s all crammed,” she said. The program also included “ride-along” or field experience to expose the students to the things they will witness when visiting a home or business to repair a refrigerator or air conditioner. The trainees were mostly from Paterson, according to Michael Powell, executive director of the Center for Continuing Education & Workforce Development at the Passaic County Community College. All ten students were also provided training on preparing resumes and excelling in job interviews. The college and Haier had five employers, among them Sears and P.C. Richard & Son, on site for speed interviews with the newly minted technicians. Charles Brown of Kinnelon said he received an offer from Sears for a home repair technician post. He said other employers have told him he would soon receive phone calls. This program is similar to a 2003 and 2013 program that Haier ran, said Reynolds. He said those two iterations had 85-percent job placement rates. For this cohort, the college will monitor the graduates to measure the success of the program. Powell said the college conducted an employers’ roundtable in which employers pointed to a need for trained technicians. “This is a national crisis. Utilities are saying all our people could retire tomorrow. But, where’s the pipeline?” he said. The pipeline is being built through programs like the one at the college. Steve Rose, president of the Passaic County Community College, said the school has already put together a second cohort which will begin classes next week.